After a near-complete drawdown of Wickiup Reservoir last fall and a snowpack that has been well below average so far this winter, water managers are not optimistic about filling the reservoir and having a full water supply for this summer. This will have a big effect on the river and on irrigators. What does this mean for the river and irrigation? Irrigators in Madras and Culver rely heavily on water stored in Wickiup Reservoir to water carrot seed, potato, and garlic crops. With a reduction in water supply, even more land than last year will need to be followed. “Last year I fallowed 25% of my land,” said third-generation Madras area farmer, Phil Fine. “Imagine if you could use only 75% of your business – that’s what it’s like for us farmers.” This year, Fine anticipates further increasing the amount of his land he fallows to mitigate for water shortages. 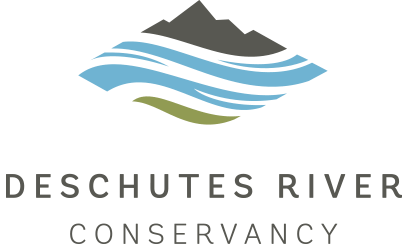 The relationship between the river and irrigation is complex and something that the Deschutes River Conservancy (DRC) has been dedicated to solving over the past 23 years. The organization works with a board of diverse stakeholders and partners to collaboratively restore flows and improve water quality in the Deschutes Basin and to date, this work has restored over 200 cubic feet per second to Central Oregon’s rivers and streams. To put this in perspective, that’s more than eight Olympic-sized swimming pools per hour pouring back into the Deschutes Basin. On the heels of a three year Upper Deschutes Basin Study which provided crucial information about water needs in the basin and strategies to meet instream and out of stream demands, the DRC has been working with Basin stakeholders to accelerate the implementation of strategies to improve conditions for the river and for water users. Local irrigation districts have completed system improvement plans to upgrade how they deliver and use water in Central Oregon and are in the process of implementing these. By updating 100-year-old canals and inefficient irrigation methods, water-plentiful districts can conserve enough water to share with those who regularly face scarcity. DRC is also working with irrigation partners to expand market-based opportunities, like water rights leasing programs, to free up water supply. With less pressure on filling the reservoir to meet irrigation needs, more winter flows can stay instream to improve the health of the river. For example, the DRC is supporting Central Oregon Irrigation District’s efforts to pipe one of its main canals which currently leaks up to 50% of its water. When completed the water conserved from this project will make a significant difference in restoring Upper Deschutes winter flows. “Seeing people come together to make the river better for future generations while supporting the agricultural community is encouraging. It’s an important legacy for us to leave,” Fitzpatrick stated. Previous article: Tickets for our 2019 RiverFeast Dinner & Auction now on sale!